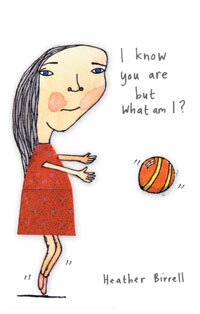 Heather Birrell is the author of two story collections, Mad Hope (Coach House, 2012) and I know you are but what am I? (Coach House, 2004). Her work has been honoured with the Journey Prize for short fiction and the Edna Staebler Award for creative non-fiction, and has been short- listed for both National and Western Magazine Awards. Birrell’s stories have appeared in many North American journals and anthologies, including The New Quarterly, Descant, and Toronto Noir. She lives with her husband and two daughters in Toronto, where she teaches high school English. Learn more at www.heatherbirrell.com. I think I knew I wanted to write (although not necessarily write books) sometime in my turbulent twenties because writing is a means of articulating a problem, and sometimes (sometimes) articulating a problem can help a person to solve it or at least look at it in a different — harsher or more forgiving — light. And then it’s pretty natural to want to share with someone once you’ve laid a problem bare — there is both an altruistic and arrogant component at play in the act of publishing. I have a full-time day job and two small children, so the idea of a writing ‘routine’ is pretty foreign to me. The nice thing about this is that when I do actually carve out time to write, I’m pretty grateful and focussed. The terrible thing is that these oases of time can be few and far between. There is a cafe about two minutes away from our house that I treat as my unofficial office. My three year old knows that when I leave the house with my laptop, I’m going to my ‘job’. At the beginning of my mat leave with my second child, I left the baby with my husband or my mother and dashed out to the ‘office’ between breastfeeding sessions. I sometimes work with a writing partner — it’s a bit like a workout buddy, a friendly, motivating force. It can be really difficult to keep on with a project when you are exhausted and have about 112 other things on your plate. But I always feel better if I do, like I’ve nurtured an oft-neglected part of myself. I write in a notebook and edit on the computer. It is rare for new material to emerge while I’m typing. Most of my being is resistant to writing. I have to compel myself to focus/write with a pen in a notebook by using a timer and forbidding any intrusion of the bitchy editorial team with whom I share a brain. I’m not too superstitious or deliberate about this — I mostly read whatever interests me at the time. And of course whichever texts I need to read research-wise. Story collections: Nathan Englander’s What We Talk About When We Talk About Anne Frank, Don’t Cry by Mary Gaitskill. Novel-in-stories: Carrie Snyder’s The Juliet Stories. Poems: Joy Is So Exhausting by Susan Holbrook. Such a hard question — because the answers are always changing, and I will always feel my response to be incomplete… I’m not much of a re-reader but I love Ann Patchett’s The Magician’s Assistant and have read that book many times — it has a tricky cathartic quality about it I can both experience and admire. Dostoevsky’s Crime and Punishment for the way it messes with my head. Haruki Murakami’s The Wind Up Bird Chronicles. All of Deborah Eisenberg’s beautiful oeuvre. Ditto Grace Paley and Alice Munro. Anne Enright’s The Gathering. The Chronicles of Narnia. I find much to admire in Paula Fox and David Mitchell’s writing. And I often return to Sue Townsend’s Adrian Mole, a brilliant creation. Reading — as long as my library is unlimited. Oh, I’ll choose Relaxation, because it begins with R, and alliteration is one of my things, and because it acts as an umbrella term for all kinds of obsessions and distractions. You are currently reading The Three Rs: Heather Birrell at Slightly Bookist.